This section provides a tutorial example on what you will see on Google Chrome 35 when visiting a Web page that uses Flash without Adobe Flash Player enabled. Google Chrome 35 comes with an integrated Adobe Flash Player plugin. So normally, you don't need to install any additional plugins to view Flash Web contents in Chrome. 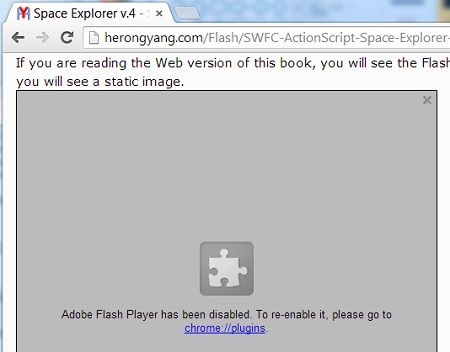 To verify if your Chrome has Adobe Flash Player enabled or not, you can run Chrome and visit this Web page at http://herongyang.com/Flash/SWFC-ActionScript-Space-Explorer-Stabilized.html. If Adobe Flash Player is enabled properly, you will see the Space Explorer Flash running near the bottom of the page instead of the "Missing plugin" icon. See next tutorial on how enable Adobe Flash Player on Chrome 35.